This is a project I recently finished. 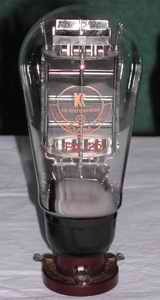 It is a no-compromise Power Amplifier built for a friend of mine. He did the "Wood-thing" and I finished it electrically. 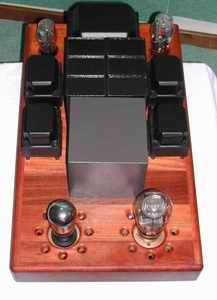 Its lay out matches my poweramps though different tubes are used. 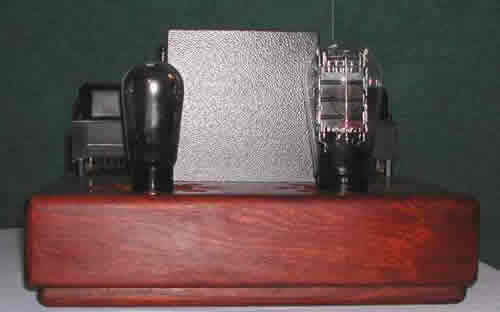 The power amplifiers are mono-blocks, with separate powersupplies for both driver- and powertube. The driver is an exotic tube from Valvo, the Ca. This one is choke-loaded (Lundahl LL1667/25mA) and coupled using a 0.22mF Ultratone capacitor to the KR Enterprise PX25. The OPT's used are AE's (Automatic-Electronic Holland), with silver wounded secondaries on an amorphous core. Power transformers and chokes are also AE's. No budget components, so to say. Let me show you some pictures.. Very good quality components are the key-word here: A common powertransformer, supplying high voltage and heater voltage for both driver- and power tube. Both the power supplies have a C-L-C-L-C powr supply. Capacitors user are paper-in-oil by Philips (12mF/600V each), chokes are 6 sections in series, 10He/200mA each. Internal wiring is 0.8mm pure silver, in PTFE-tape wounded. The Ca is a DHT, heater at 3.65V/1.1A, mu about 9, thus heated on DC. 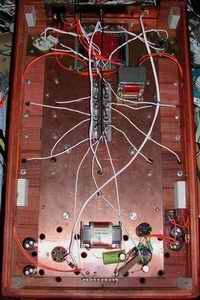 This is done using a double current source with LM350's. Firstly the PX25 was to operate on AC, in practice however, 2.5V can be very quiet and 4V is not when using speakers with a >93dB sensitiviy. This was cured using DC, however DC can give a "bleeched" sound compared to AC. A simple way to get along this is to use a simple 80 turns air core spool.... (really!). Fortunately the gossip around KR's PX25 having different values for each tube was not true. A rock solid adjustment for both tubes within 1 mA difference was obtained. You can look at the schematic here. And the sound?? Well, in my experience the sound of really played-in amplifiers can be heared at the very first minutes after starting it up the first time.For some reason that is gone and can be heared again when played-in. With these amplifiers I can only say that the very first minutes lasted too short! You'll hear from me again in a couple of weeks!! !